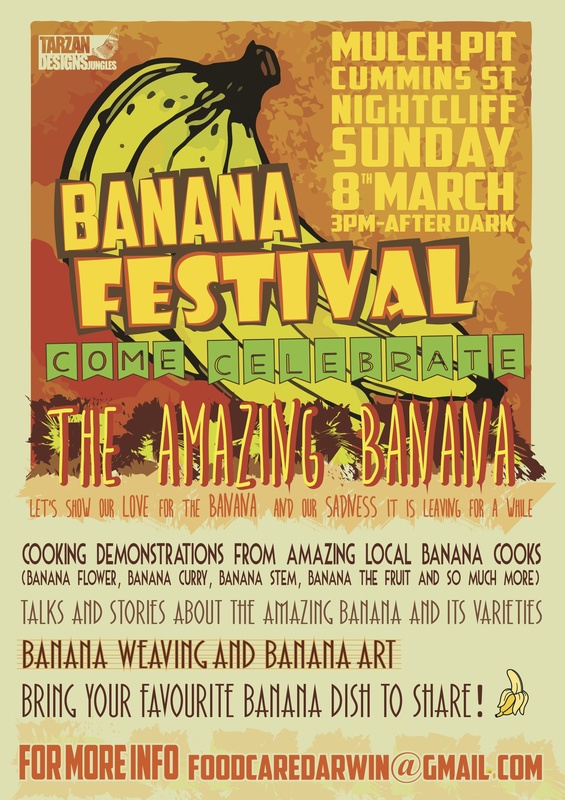 Here it is the fabulous announcement of The Community Banana festival! March 8th at The Mulch Pit in Night cliff. Join us in our love of the banana and our sadness it is getting destroyed- Come and celebrate how amazing the banana is, join in a weaving workshop and learn about its fibres, see cooking demos of all its parts- trunk, leaves and fruit. Enjoy some banana inspired songs, banana art. Bring a banana dish to share and be part of our sunset farewell ceremony! There will also be a space for discussion/ a panel! Please contact us if you would like to contribute. We are looking for more banana trunk cooks and crafters! More banana info and links soon….